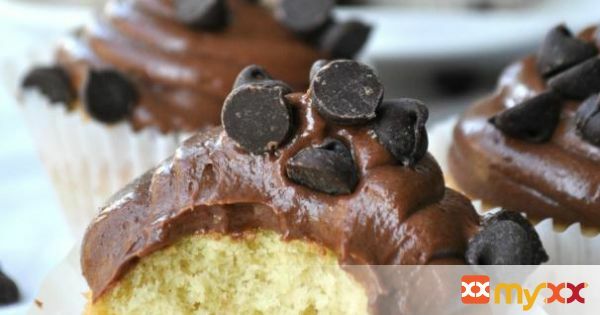 Remember those days when we happily nibbled on vanilla cupcakes and overly sweet chocolate frosting, not because they were even that good, but because that's all we knew. The only difference is this time it's going to taste good. I mean so good, you're going to find yourself having to make another batch cause you somehow ate a dozen cupcakes in the span of writing a short paragraph. 1. Make the frosting first. 2. The first step is to make powdered sugar. In a food processor, pulse together equal parts of granulated sugar and cornstarch ( If you have store-bought powder/confectioner's/icing sugar, you can use that also) Sift it and reserve in a bowl. 3. In a small bowl, melt together the chocolate and the butter. You can do this in a double boiler or in the microwave at 30 second intervals. 4. Add the chocolate mixture to a large bowl and mix in the sour cream and salt. 5. Slowly add in the powdered sugar while beating with a hand mixer. Transfer frosting to a piping bag and chill it in the fridge. 6. Now let's make the cupcakes. 7. Cream together the butter and the sugar with a hand mixer until it becomes pale and fluffy. Add the eggs one at a time, beating thoroughly after each addition. Stir in the vanilla. 8. In a separate bowl, sift together the flour, baking powder, and salt. Gently fold the dry ingredients into the wet ingredients. Try not to over mix it because that'll cause the cupcakes to become tight and dense. 9. Divide the batter into a dozen cupcake molds. I used white cupcake baking liners and sprayed the insides with vegetable oil. Fill each cup 3/4 of the way up. 10. Bake in a 350F degree oven for 18-20 minutes. Check after 16 minutes. 11. Once they've cooled for 15 minutes, frost and garnish with chocolate chips.